I would first like to say, as most know how I review who seen them, my computer is setup just to game, it is not optimized in any way to get max performance out of every last piece like disabling things to get a fraction more out of it. It is not a fresh install of windows, I use this computer to game on like an everyday computer to bring a feeling of an end user usage. Motherboard: Asus Maximus IV Extreme ?P67? Introducing the packaging, Here we can see the Zotac logo, what version of the line it is, and the features it comes with. Flipping it over, you see some more Zotac specific features like the FireStorm Overclocking Utility allowing for Performance access to fine tune, Quick boost for 1-click instant acceleration, and real time control panel readings like temperature voltage and speed ect. Also the IceStorm Cooler setup, Windows 8 compatibility and of course some system requirements. 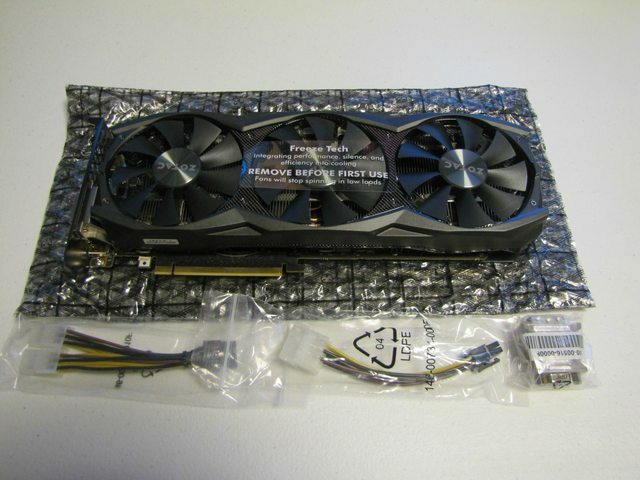 Opening the box, you are presented with another box which is all blacked out and a reflective Zotac logo holding the card safely inside. Removing the contents of the Graphics card box, you are presented with a dual 6pin to 8pin, dual molex to 6pin, DVI to VGA, as well as the 980 Ti AMP! 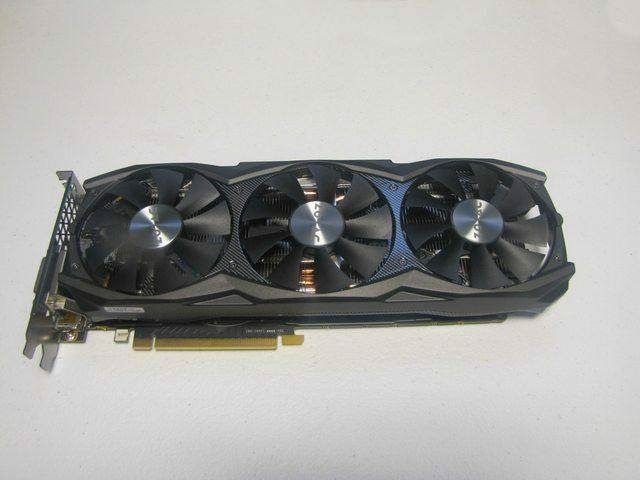 Edition graphics card. A nice little reminder as well, informing you about Freeze tech with the label on the middle fan about it's fans do stop spinning at low loads. So, while we look at the picture below I want to point out we have a replica of their 970 AMP! 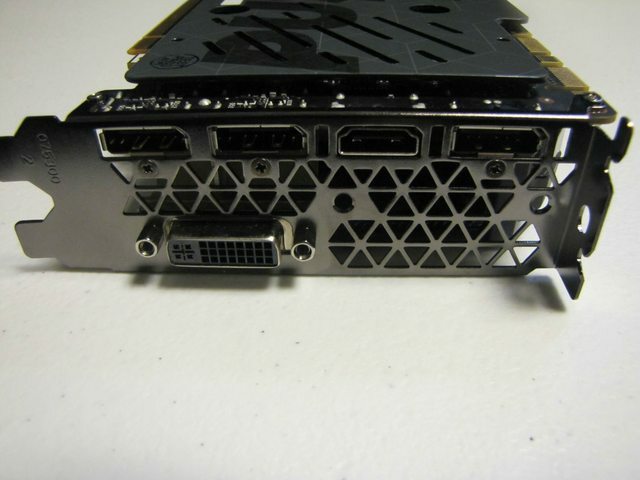 Extreme Core edition graphics card for the cooling, if you would like to take a look at this picture http://i.imgur.com/neQanhbl.jpg they look identical because they use the same cooler. Removing the 970 AMP! Extreme Core edition, we show the card by itself with the Triple-fan IceStorm w/ Carbon ExoArmor which will cool this beast while you game heavy with 5 copper heat pipes throughout the cooler. 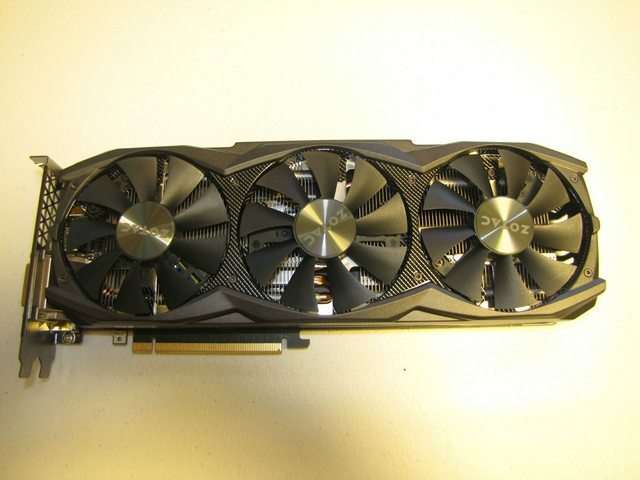 Noting, this card sits at around 31cm or 12.2 inches. Also a nice close-up on the middle fan to see the carbon fiber detail. 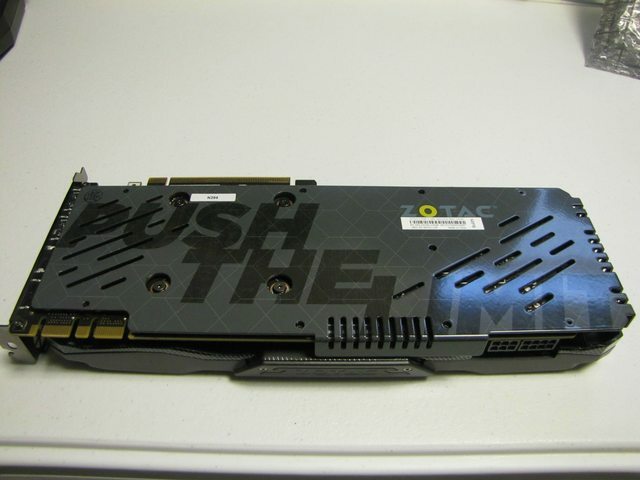 Flipping it over, since the 980 Ti release from Nvidia, Zotac decided to go with a Wrap around backplate "Please excuse the glare, This thing is shiny!" to help aid the resist of warping instead of a regular ol backplate. As you can see, It shows Push The Limit "In the correct facing position might I add" A nice Sized Zotac logo, some slots most likely to allow airflow still, Also let me add this is All metal and gives quite a quality feel to it. Then To show one more, Here you can see just how much this backplate truly wraps around the card. 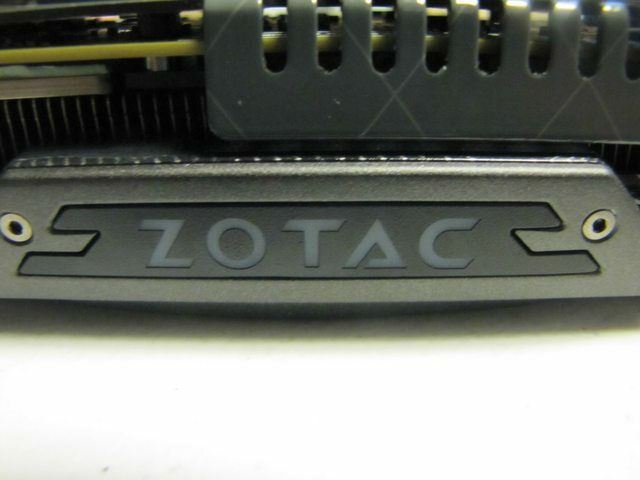 Of course, Back to the Visible piece in most cases, The Side of the GPU showing off the Zotac logo. Sadly though, For some odd reason this does not illuminate and quite disappointing for eye candy. So now getting into some settings for the Graphics card, Sadly for now it seems that the current version of Zotac Firestorm does not support any fan readings for this graphics card, as when on load it shows N/A as you can see below. 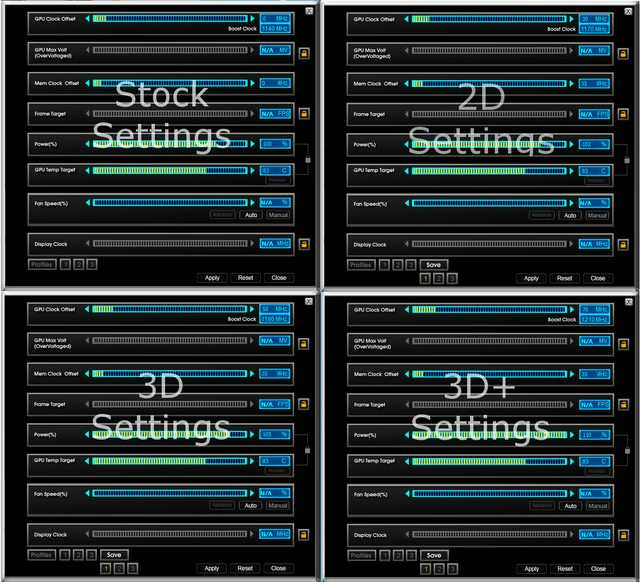 Momentarily Let's take a look at the different OC Settings for their One Click optimization they have to offer if you want a little more out of your Stock settings that come with the Graphics Card with the Quick Boost One Click Instant Acceleration. Continuing some settings, I want to talk about their Freeze tech setup which allows for the fan to stay off until load seems to start the fans at around 65c, while it turns off at around 55c. I personally would have liked to see the fan turn on at around 55c and turn off at around 40c due to the fact that while Idle this card can sit at around 30-35c in most normal cases, giving it more of an optimal setting most average users may experience. Zotac has also noted it's due to the sensor, Maybe in future cards they will take note and adjust if this cannot be updated based on bios. Lets get into some performance now! For game settings, All were practically maxed out, and details on what was changed are below per game. Wanting to give everyone more than just 1080p I decided to run DSR from Nvidia and give some higher resolution performance in this review, While it may not be exactly what we would see, it's close and as well as for those who want to run DSR possibly till they want to get a new monitor. I do want to mention, For Hitman Absolution, As well as Grand Theft Auto V I used their games built in benchmarks as it does a Fine job at replicating actual gameplay. 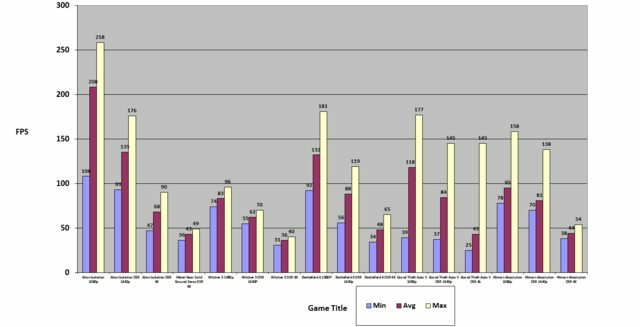 For GTA-V though, I took each Pass of the benchmark which was 5 passes and put them together and divided by 5 to get the average FPS for Min Max and Average. Besides those two games, I used Fraps to record all actual In-game gameplay finding spots that truly made it works getting low and high FPS. For all the settings everything is set to Very High besides listed below. My room with an ambient temperature of 85F which is around 30C and normal for my room during the summer sadly without AC. Although with the cooling setup they implemented the GPU Hit a max of 74C and 70% fan speed. While some people may not deal with this type of extreme ambient temp while at home, it shows how good this GPU can keep cool under already hot ambient room temperature Benchmarking and gaming all day. Throughout the time using the Graphics card, the fan started to be only as loud as a basic stock CPU Fan so it becomes audible at around 65% Fan speed but it still is not an annoyance to where you hear it over your sound from a game or something like music or even some of your system setups regardless due to as said CPU fans or case fans. For ease of mind, Here are Firestrike 1.1 and Heaven Benchmark for those interested as it's all about the games to me, but may as well toss em up for those who care. 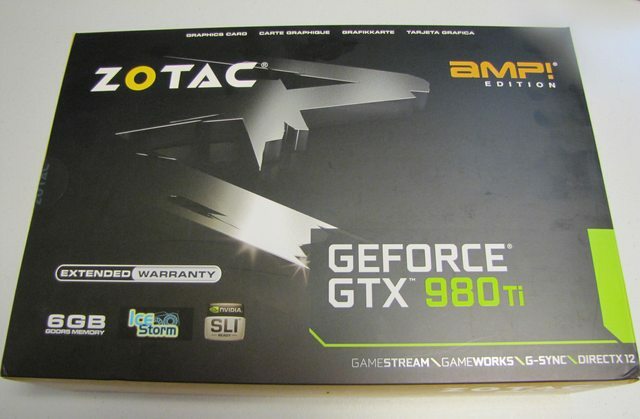 Ending things off, The Zotac GTX 980 Ti AMP! Edition is a Fantastic buy for few reasons. It's a reference board meaning for those who Watercool them in the future don't have to fight to find a compatible waterblock or wait for one. So you end up getting aftermarket cooling, Reference PCB and an overclocked gpu for the price of a reference GTX 980 Ti. Then add in extended warranty with a nice wrap around Backplate to keep things in check. With the High Performance this Card gives capable of running your 120/140Hz monitors at both 1080p/1440p without killing your detail, and then also potential for 4k 60Hz monitors with high settings. 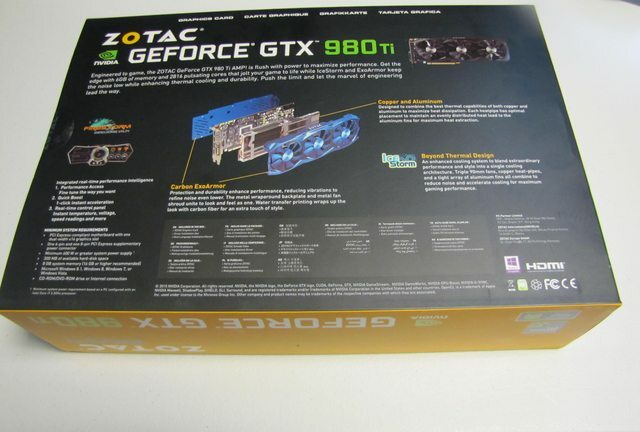 So if you want to get a 980 Ti, Zotac's GTX 980 Ti AMP! is just for you since it costs the same as the Reference Nvidia card while adding Zotacs touch of cooling with a factory overclock. 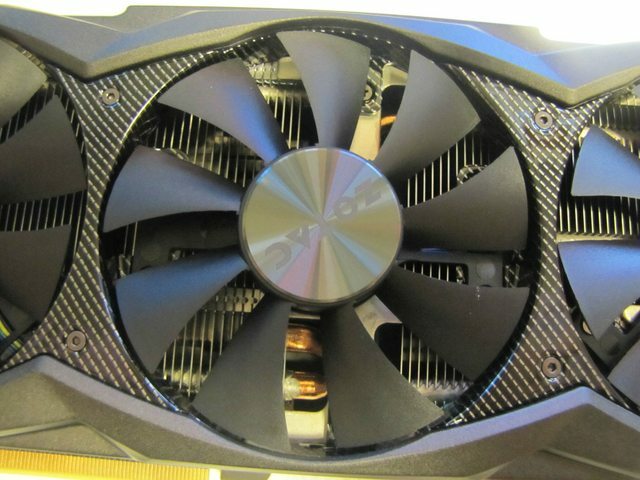 One thing I do not understand is why they decided to not illuminate the Zotac logo, Although it's the same cooler on the GTX 970 AMP! Extreme Core which does illuminate. Regardless of the Extra length of the card due to the Cooler, Please be reminded this is still a long card and may not fit into some form factors and configurations due to compact cases. As in my eye's It is a MUST BUY due to pricing and performance compared to the Reference Nvidia GTX 980 Ti. Rated, I would give it a 4.5/5 as it's a great take at a competitive price on the reference design. Freeze tech "Fans turn off on low load/temps"
GPU Sag "Backplate seems to add some heft"
Solid job with the hands-on review Cody maybe we can see a pic or 2 of that smexy looking beast in your rig when you get a chance. Super nice .Thanks for sharing. Thanks, Cody! Always appreciated when you share your info. 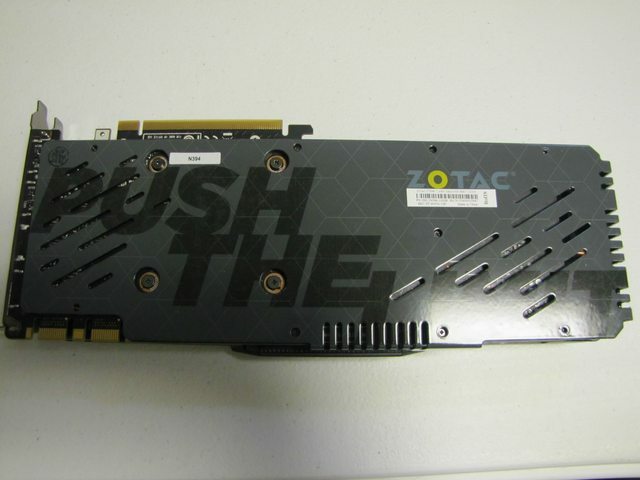 Zotac is making some really nice cards these days. Hopefully they partner up with a mfg to make blocks for some of their cards soon. Sorry for the delay Cody. Always like seeing reviews from an outside perspective. Keep up the good work. Solid review, thanks for sharing. It is a good price for the card. I like the eye candy though and wish it did have the light up logo too. Thanks man! Also yeah I was shocked to learn it was the same cooler but no logo lightup, especially since it has the same clear material where it would illuminate. Which is why it was a con as it baffled me why it was excluded when it is the same.